American soldier and topographical engineer. Born in Greenwich, Mass. He became (1841) a topographical engineer in the U.S. army and engaged in surveying the U.S. borders with Canada (1844-49) and Mexico (1849-53). In 1853-56 he had charge of the exploration from Fort Smith, Ark., to Los Angeles for a projected transcontinental railroad route near the 35th parallel of latitude. Whipple was to study the route from Arkansas, via Albuquerque and Zuni, to Los Angeles. 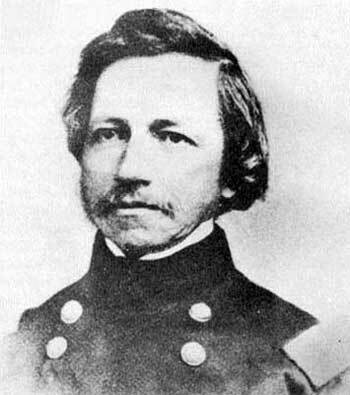 Whipple, guided by Antoine Leroux, who had been with Lorenzo Sitgreaves’ expedition two years earlier, left Fort Smith, Arkansas on July 14, 1853. His scientific staff included astronomers, geologists, naturalists, artists, botanists, and surveyors. Also with him were 70 men, 240 mules, a train of freight wagons and a very large flock of sheep for food. This was the route that was later to become portions of the approximate alignment chosen for Route 66 across New Mexico, northern Arizona and across the Mojave Desert into Southern California. The detailed, illustrated reports and diaries became valuable anthropological documentation of the Native Americans of the Southwest. He became chief topographical engineer under McClellan during the Civil War. In 1862, as brigadier-general of volunteers, he was charged with the defense of Washington on the Virginia side. In a skirmish at the close of the battle of Chancellorsville he was severely wounded by a sharpshooter. He died several days later in a Washington hospital. In 1858 Lieutenant Ives named a mountain range along the west bank of the Colorado River for Amiel W. Whipple. These mountains lie east to west in what is now the Whipple Mountains Wilderness. Botanist, John Torrie, named the Yucca Whipplei (also called Our Lord's Candle) in honor of Whipple. Fort Whipple - Prescott, Az. This army fort dates from 1863 named in honor of Brigadier General Amiel Weeks Whipple. The post played a major role during the Indian wars and was maintained until 1912.